Go Buy Milk (Or Teach Heel). Not too long ago, I asked my husband to stop and buy butter and milk at the store. It’s such a simple request. “Please buy butter and milk.” How hard can it be? Buying dairy is harder than it seems apparently. Between organic, 2%, skim, homo, fine filtered, lactose free, goat, I know that “Please buy butter and milk” will probably result in a flurry of text messages. That confusion is absolutely my fault. I know the dairy counter is filled with wall-to-wall milk choices. I failed at communicating. If two humans can miscommunicate about “Go buy butter and milk”, a seemingly easy task, how much more likely is it that we miscommunicate with our pets? We are not even the same species. For example, heel position means many things. Put your behind on the ground. Do so beside my left leg. Keep your body parallel to mine. Move your body into heel following a precise series of steps. Sit not too close and not too far away. Learn to control your hind end as you swing in tight. Sit in heel is about as complicated as “Go buy butter and milk.” There is a lot going on behind that very simple request. Communication is hard. Dogs can learn to understand us. They are at an incredible disadvantage. Using words is not in their nature. Some handlers have a knack for making these skills look easy. It’s not because they have some magic in their pocket, but rather that they engage in thoughtful, planned training. Communicating a beautiful heel position is a skill – like a teacher that captivates a classroom or a couple that understands each other’s nuances. 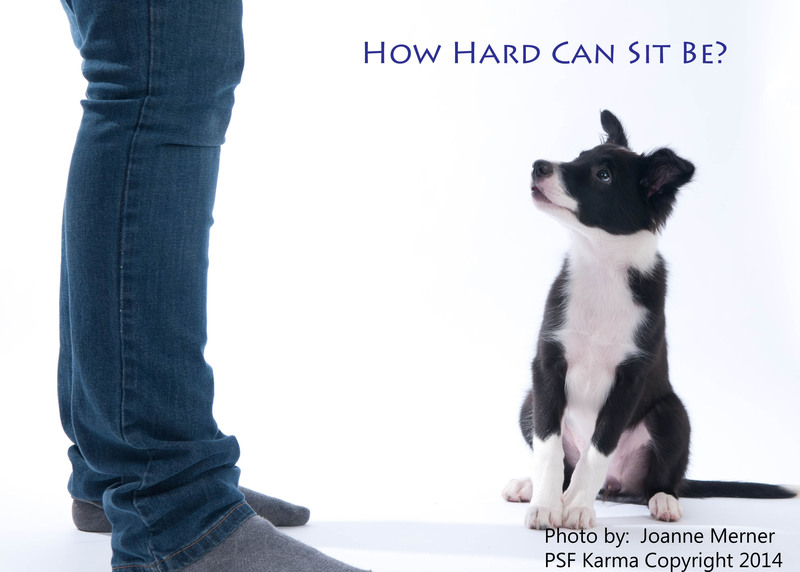 A skill taught well to a dog, polished and finished is an indication that someone cared enough to teach well. We should absolutely celebrate improvements along the way. However, habitual crooked sits or the inability to wean away a lure speaks volumes. Never finishing and polishing a skill is a shame. Which skill does not matter. No one has to enter the world of competition behaviours. Completing your dog’s “shake a paw” trick is a very worthy goal. Get the behaviour on cue and achieve stimulus control. At least it has the benefit of stopping enthusiastic and repeated swatting and scratching of people’s arms. It develops skills that carry over to other real life scenarios. The beauty of a perfect heel, chase turn, rear cross or cute trick is not in a ribbon or medal. It is in the experience of learning to finish a task from start to finish. We learn to persevere, adapt and communicate more fully. The dog shows its comprehension by demonstrating the skill – flawlessly. The dog learns to attend to the cue, and not a lure. Dogs learn to offer behaviours only when asked. Our gestures and movements begin acting like spoken words. Make that journey. Achieve the most perfect form of behaviour possible. Eliminate lures, create stimulus control, and work on minute position changes on at least one skill because it’s an important skill to have. Eliminating lures and contextual cues in a routine are the same skill set found in rehabilitation programs. They are not optional accessories in a dog-training toolkit. A trick can be a opportunity for growth. Effort is required for the simple things, perhaps even more than for the complex. Mistakes glare on simple skills. It’s just you, the dog and a sit. Not much hides a sloppy sit or unfaded lure. Failing to communicate all the elements of a behaviour is not much different than saying, “Go buy butter and milk.” It’s too vague. Be prepared to eat some crow when they bring home buttermilk. Don’t expect dogs to do much better with partial instructions either. Good communication looks like magic, but it is really just a whole lot of effort on our part. Only in its absence do we miss it. It is something that everyone can achieve with their dogs if they set a goal, create a training plan and go for it. Start with, “just one behaviour – as close to perfection as possible.” Finish it. You may find that it gives you something more valuable in return. Previous Previous post: Science says … a lot of things. Next Next post: eMDR or HAT Treatment offers insights into dog behaviour problems.